The AN/APS-143(V) is an X-Band maritime surveillance and tracking radar designed for installation in a variety of fixed-wing aircraft and helicopters. It is known as OceanEye. 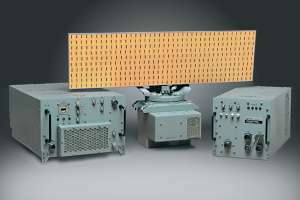 The system uses a traveling wave tube (TWT) transmitter, frequency agility and pulse compression techniques, and consists of three units: an antenna, transceiver and signal processor. The antenna system is pitch-and-roll compensated. Control of the radar may be carried out by a dedicated control panel, or by a central universal keyset via a MIL-STD-1553B databus. Features include track-while-scan, air search mode with moving target indication customised for the individual platform, integrated electronic support measures interface and an integrated identification friend-or-foe system interface. The APS-143(V)3 has small-target detection capability and is smaller in size. This variant features a track-while-scan function and a MIL-STD-1553B databus output to a central tactical navigation computer.